Happy Chinese New Year everyone! Wishing you a prosperous year ahead and here to help you out is a typical Chinese treat that is said to bring luck and ‘family cohesion’ … or at least the joy of eating a surprisingly delicious treat that isn’t too sweet! This light rice cake has a soft chewy texture similar to mochi and the smell and flavour remind me of very slightly caramelised condensed milk. 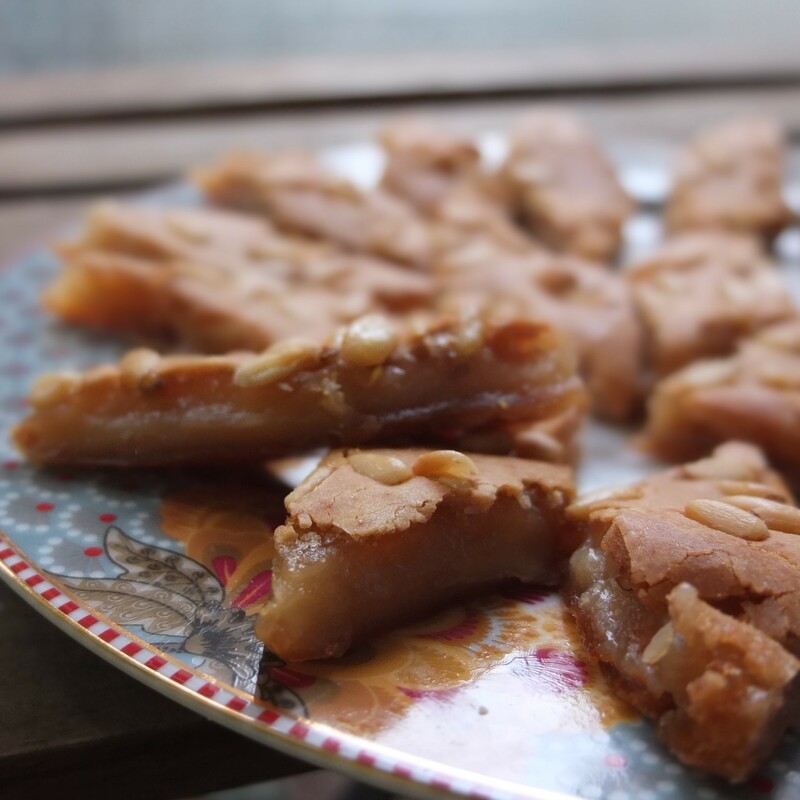 It’s made with glutinous sticky rice flour, almond milk, coconut milk, maple syrup and nut oil. 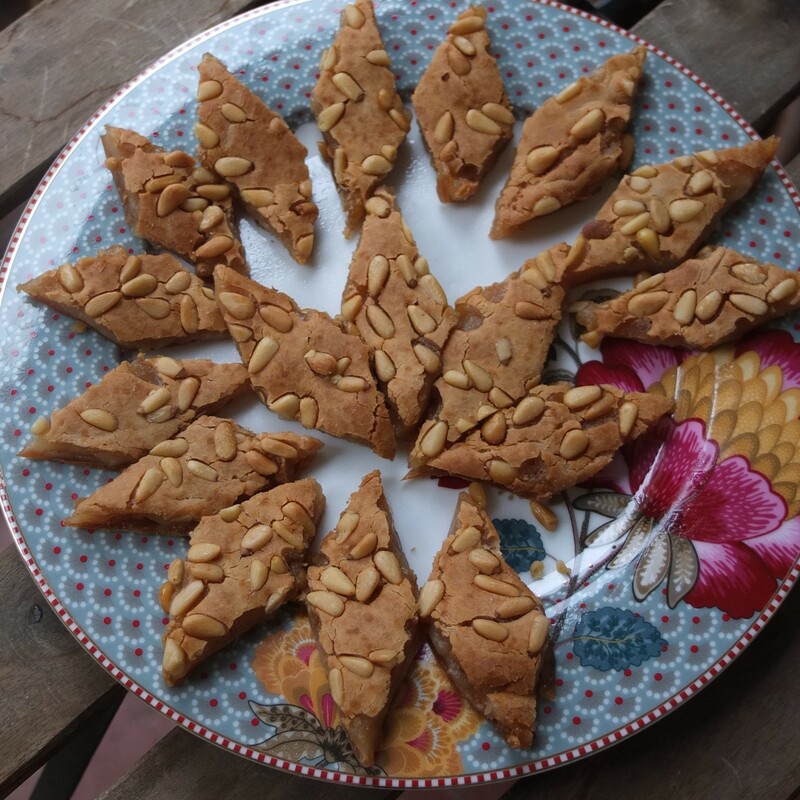 You can adapt the ingredients to your taste and instead of the typical almonds mine has pine nuts sprinkled on top, giving it a tasty lightly crunchy Catalan touch. It’s super easy to make plus baking instead of steaming adds a level of texture with a slight skin on top. So if you’d like some extra luck and are curious to try niangao or this new version, why not make your own pine nut sticky rice cake! It’s naturally glutenfree with no refined sugar and vegan too! A great start to a healthy new year! 🙂 Woof. Sorry you know it’s the year of the dog don’t you? 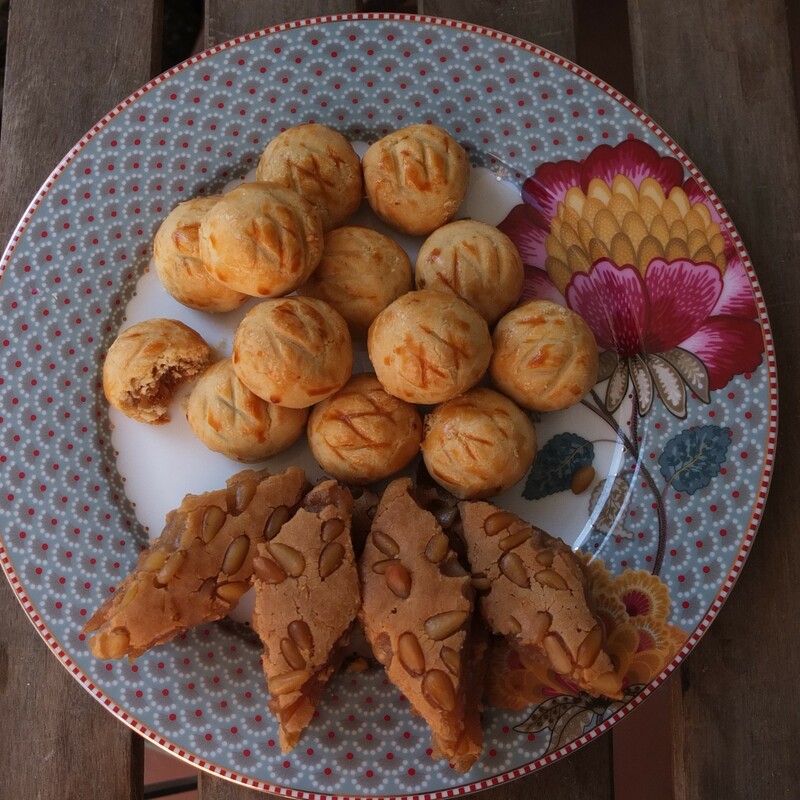 For Chinese New Year there should always be lots of yummy food around and I also made some healthier pineapple tarts (recipe here) – a gluten-free version with Doves Farm self-raising glutenfree flour replacing the flour. Ah yes definitely ready for the new year now! Yay! 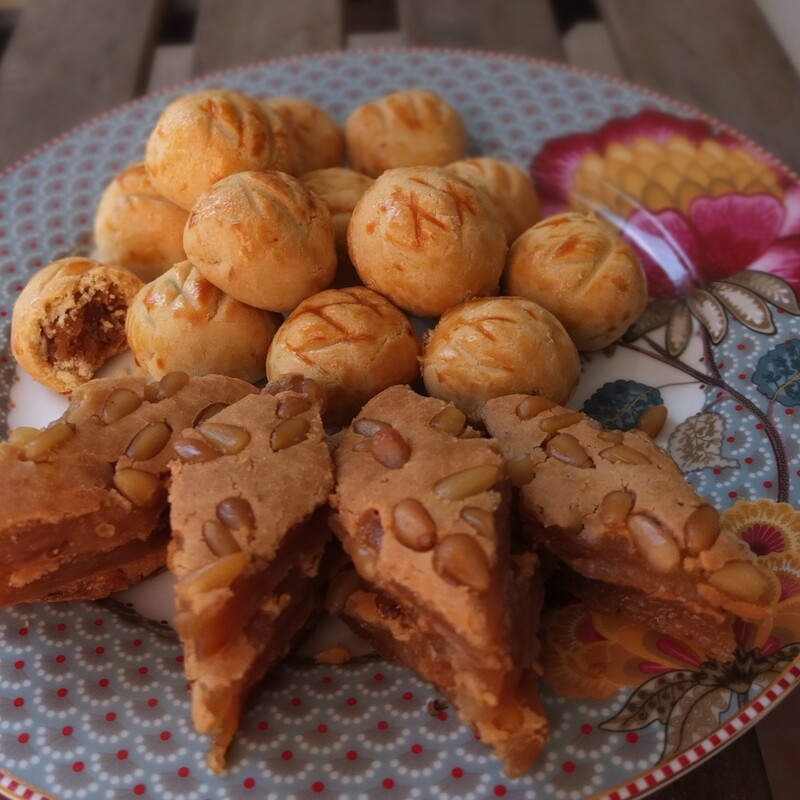 This sweet is adapted from Florence Lin’s Baked Coconut Sticky Rice Cake at Jeanette’s Healthy Living website, where you can also get more info on Chinese new year customs and food. I changed the method a little, halved the quantities and used almond milk instead of low-fat, macadamia oil rather than olive and maple syrup to replace the sugar. 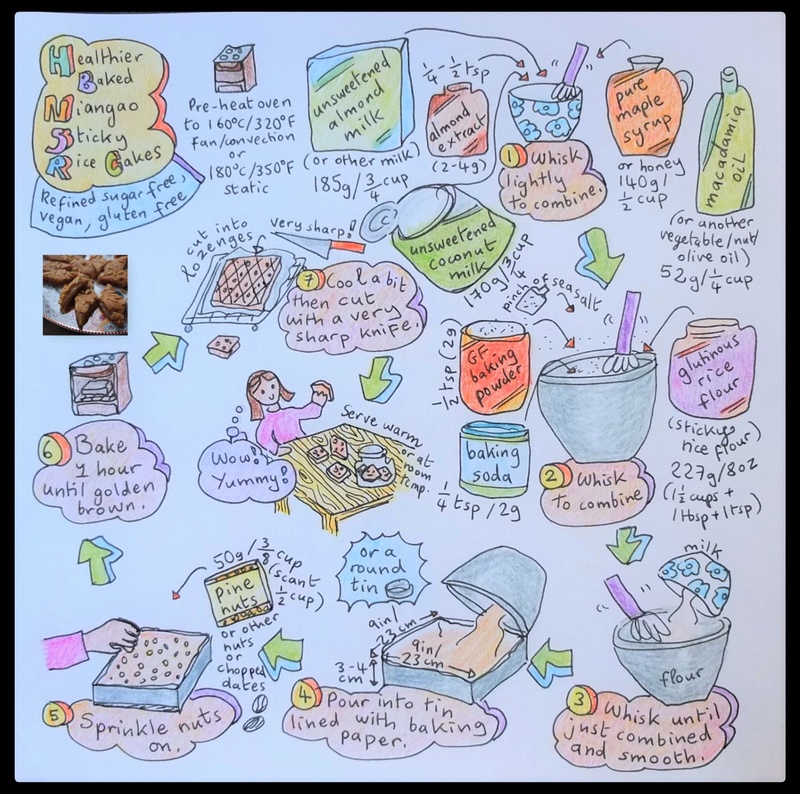 But you can use ingredients from the original recipe or substitute in your own kind of milk (you can’t taste the coconut milk flavour in the cake by the way) or vegetable oil. Use any nuts but pine nuts are great – tasty, lightly crunchy and good decoration. Almonds, walnuts or chopped dates are more typical, stirred in the mixture or sprinkled on top. preheat oven to 160°C/320°F (fan-assisted) or 180°C/355°F (static, non-convection oven). Follow the instructions in the illustration. Niangao is delicious warm and gooey or a little firmer at room temperature. It can be stored wrapped in plastic film for 2 days at room temperature, after which it gets firmer and easier to cut. After 2 or 3 days store it wrapped in plastic in the fridge. IN the freezer it keeps 1 or 2 months. Defrost frozen niangao overnight in the fridge then reheat in a steamer or microwave. I’ve read it’s very yummy pan-fried in egg batter (1 beaten egg, 1tbsp cornflour, 1/4 tsp salt) – see the kue bakul recipe for instructions. What does nian gao mean? There’s more about this cake and the versions in various Asian countries at Wikipedia’s article on niangao. Basically in Chinese nian means ‘sticky’ but another word with the same sound means ‘year’ and gao means ‘cake’ but another word with the same sound means ‘high’. So you have a sticky cake that sounds like a ‘high’ or ‘tall’ year, implying promotions or prosperity. Which is why we’re supposed to eat this cake and become lucky and rich… in the meantime having these delicious treats around the house will at least make you happy! Whether it’s warm and gooey or firmer and softly chewy at room temperature. Hard to describe … you need to eat one of these baked sticky rice cakes really! And maybe a little pineapple tart too…?